On March 2, 1837, as part of a large land grant, the Federal Government gave the tract that includes today's Lincoln Park to the State of Illinois. This occurred during an early phase of the construction of the Illinois and Michigan Canal. Beginning in 1838, the State sold off portions of the land to help pay for the Canal. 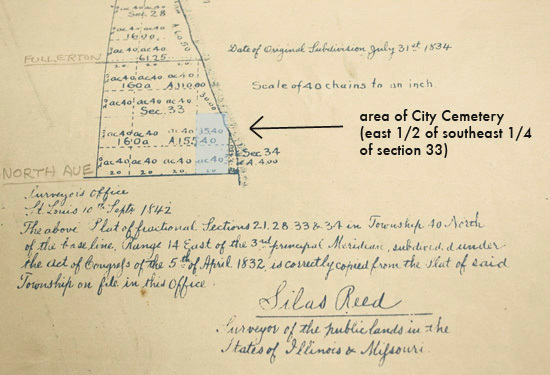 In February 1837, the State Legislature wrote an act that appointed part of the newly surveyed land to the Town of Chicago for use as a graveyard. Chicago became incorporated as a city in May, that same year. Burials in the new Chicago Cemetery began in 1843. On May 13, 1843, the Common Council passed an ordinance forbidding interments in the older burying grounds. 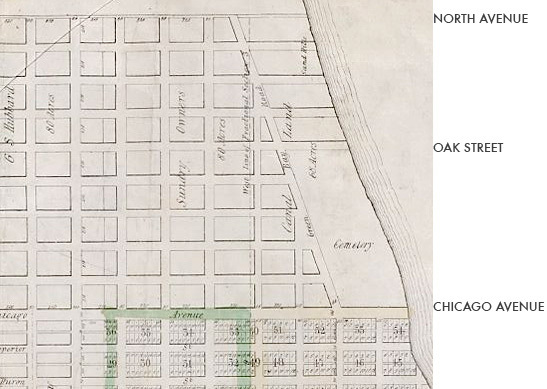 Copy of an 1834 rendering of the land along Lake Michigan, west to Halsted Street. Click HERE to go to the Illinois State Archive Database to see the first private landowners from Fullerton St. south to North Ave., and from Halsted St. to the Lake. Adjust the pull-down menus to: Section 33, Township 40 north, Range 14 east, 3rd Principal Meridian. 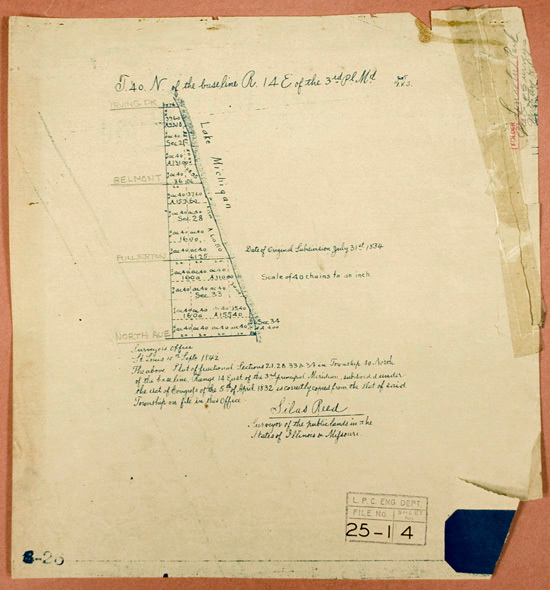 The above Plat of fractional Sections 21, 28, 33 & 34 in Township 4 North of the baseline Range 14 East of the 3rd principal Meridian, subdivided under the Act of Congress of the 5th of April 1832 is correctly copied from the Plat of said Township on file in this Office. Photographed and reproduced with permission of the Archives and Records Department of the Chicago Park District. This map shows the earlier north side cemetery that was in use prior to 1843. It was located on the lake's edge from Chicago Avenue to today's Oak Street. Its western edge was Green Bay Road, now Clark Street. Skeletal remains continue to be unexpectedly found in this area. Map reproduced courtesy of the Chicago History Museum. See the entire map in the online version of the Encyclopedia of Chicago. 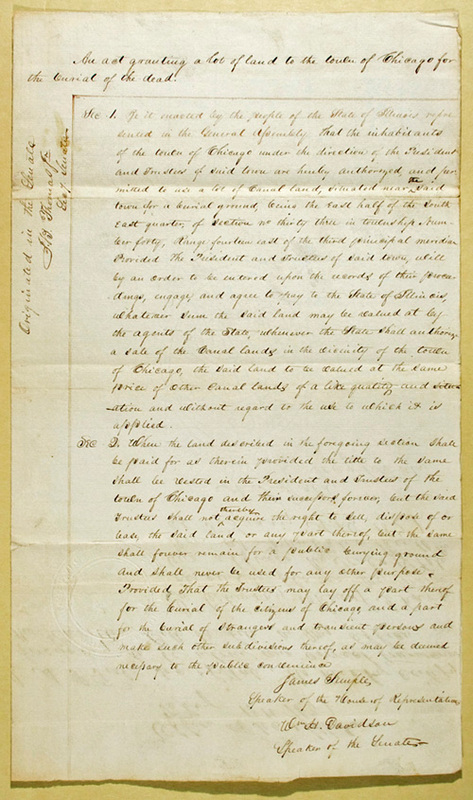 An act granting a lot of land to the town of Chicago for the burial of the dead. Sec 1 Be it enacted by the people of the State of Illinois represented in the General Assembly that the inhabitants of the town of Chicago under the direction of the President and Trustees of said town are hereby authorized and permitted to use a lot of Canal land, situated near the said town for a burial ground, being the East half of the South East quarter of section no. thirty three in township Number forty, Range fourteen east of the third municipal meridian, Provided the President and Trustees of said town, will by an order to be entered upon the records of their proceedings, engage, and agree to pay to the State of Illinois, whatever sum the said land may be valued at by the agents of the State, whenever the State shall authorize a sale of the Canal lands in the vicinity of the town of Chicago, the said land to be valued at the same price of other Canal lands of a like quality and situation and without regard to the use to which it is applied. Sec 2 When the land described in the foregoing section Shall be paid for and therein provided the title to the same shall be vested in the President and Trustees of the town of Chicago and their necessary persons, but the said Trustees shall not thereby acquire the right to sell, dispose of or lease the said land, or any part thereof, but the same shall forever remain for a public burying ground and shall never be used for any other purpose, Provided That the Trustees may lay off a part thereof for the burial of the citizens of Chicago, and a part for the burial of strangers and transient persons and make such other subdivisions thereof, and may be deemed necessary to the public convenience.